Make plans now to visit historic Goliad and Victoria during the holidays. Dreaming about Christmas during the heat of Indian summer? It’s a good thing to do this time of year, as we look ahead to cooler days and time with our families. I’d heard that Victoria and Goliad offered a unique and unforgettable Christmas experience, so last December my mother and I drove the winding roads of Southeast Texas for a weekend vacation. I’d just finished my fall semester of college, so a break was welcome relief. Our goal this particular weekend was to discover the truth behind two towns that have made their mark on Texas history. If we hadn’t been looking for Victoria, we might have passed right by it without experiencing the beauty of a town that has stood the test of time. Located 30 minutes from the Gulf of Mexico, Victoria is halfway between two major metropolises, Corpus Christi and Houston. Departing San Marcos in the afternoon, we followed a trail of autumn-leaved trees lining the road to our destination. We were booked in the Thrifty Scot room at the Friendly Oaks Bed and Breakfast, on Juan Linn Street one block from the town’s square. The two-story house was built in 1915 by F.S. Buhler and was added to the National Register of Historic Places in 1999 as the Robert H. Welder House. The current owners, Bill and Clarabell McCleod, transformed it into a bed and breakfast. The couple’s daughter was our host this weekend. After making ourselves at home in our cozy room, we grabbed our purses and headed off to dinner at the PumpHouse Riverside Restaurant and Bar. Located on a property with a rich history of its own, the restaurant sits on the bank of the Guadalupe River. The deed for the property was signed by Sam Houston, and the title was passed from the Republic of Texas to the township of Victoria in the mid-1800s. The pumphouse supplied water for the town from the river. The river’s water was used until 1908, when artesian wells were drilled on the site. Local historian Sydney R. Weisinger researched the history of the area and found that Noonie Fox and Gus Hoffman were longtime engineers at the pumphouse. They rode a buggy to work every morning and ran the pumphouse 12 hours a day, seven days a week for 40 years. The dinner at the PumpHouse was sublime. My mother ordered a chicken breast encrusted with a layer of crushed pecans, and I had a salmon fillet with steamed veggies. The night concluded with the sounds of a band playing covers of love songs and country ballads on the restaurant’s outdoor patio on the riverbank. The next morning, we awoke to the smell of freshly brewed coffee in the kitchen and breakfast coming out of the oven. We joined our host in the dining room and enjoyed a plate of fresh fruit, homemade blueberry scones and eggs and bacon baked in a muffin tin. After that very filling breakfast, we put on our walking shoes and set out for a busy day of sightseeing, starting with the Texas Zoo. 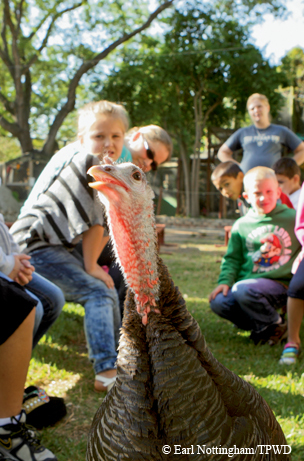 The Texas Zoo is home to many Texas animals like this wild turkey. The Texas Zoo is an intimate facility on Victoria’s Slayton Avenue, right next to the PumpHouse. Home to mostly Texas animals such as javelinas, white-tailed deer and coyotes, the zoo also has an aviary, a petting zoo and glass cases filled with “creepy crawlies” of all shapes and sizes. After taking in the zoo, we visited the Museum of the Coastal Bend at Victoria College to learn more about the different cultures at work in the town during the past several centuries. Located on the edge of the campus, the museum includes artifacts from the area’s ranching history and ancient cultures, such as the Buckeye Knoll archaeological site, dating back more than 8,000 years. Near the door are cannons from the sunken French ship La Belle and an iron safe that looks like something out of a movie. For lunch, Mumphord’s Place BBQ came highly recommended. It’s a slice of home-cooked heaven on a grill. As you walk in, you feel as though you’re being welcomed home for Sunday dinner. The walls are covered with trophies from local schools, football jerseys and memorabilia, and we overheard conversations between the guests and cooks about last Sunday’s church attendance. We both had a sliced-brisket sandwich with iced tea and watched a football game on TV. The stop made a perfect break from all of the walking we had done and fortified us for our journey to Goliad that afternoon. A 30-minute drive down U.S. 59 south from Victoria leads straight into the heart of Goliad. The town was glittery with Christmas decorations, and there were holiday activities for the whole family to enjoy in the historic downtown area. With an ice skating rink, costume contests for dogs and Santa Claus arriving on a longhorn, the first weekend of December in Goliad was filled with events embodying the true spirit of Christmas, Texas-style. At Goliad State Park, we stood in awe of the historic mission. Mission Nuestra Señora del Espíritu Santo De Zuniga, or Mission Espíritu Santo for short, was restored by crews of the Civilian Conservation Corps in the 1930s, and restoration continued during the 1970s by the Texas Parks and Wildlife Department. The mission is filled with galleries of artifacts found on the property that were used by the site’s earlier inhabitants. After touring the chapel and the galleries inside the mission walls, we wandered over to the Aranama Trail. The trail is a brisk quarter-mile long and includes a wooden bridge leading to an area that looks as if it was inhabited around the same time the mission was in full swing. 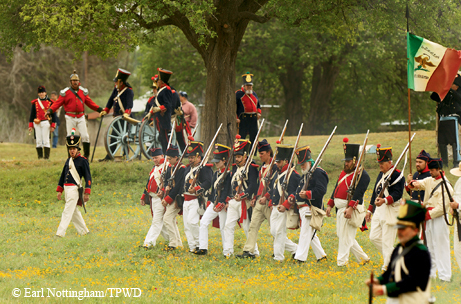 Re-enactors fight the Battle of Coleto Creek near Goliad. Down the road from the state park is the Presidio La Bahía, a fort with a history that reflects the tumultuous struggle for control of the area in the 1700s and 1800s involving the Spanish, French, Mexicans and Texians. The presidio houses a museum mapping the site’s history and gives detailed accounts through artifacts and presentations of how the six flags of Texas and three flags of revolution flew over the presidio. The grounds surrounding the presidio have just as much history as the fort itself. In front of the fort is a memorial statue to Gen. Ignacio Zaragoza, along with his restored birthplace. Nearby is the Fannin Memorial Monument, with the names of Col. James Fannin’s Texas Revolution troops inscribed in stone, plus a memorial to the Angel of Goliad. For our meal that evening, we decided to pick up fast food and picnic at the state park so we could watch the sun go down and the lights of the mission come to life. While our food was not fancy, the view sure was. That night, the mission was hosting Christmas at the Mission, including a presentation by the Beeville Community Chorus directed by James Lee. We were led down a path lined with paper lanterns to the chapel where the choir performed. The choir filled the room with songs and solos that echoed within the chapel. The next morning, we had the best breakfast of the weekend. One of the specialties of Friendly Oaks is baked grapefruit. The grapefruit is coated with sugar, then baked in the oven, and comes out perfectly tender. It will leave you wanting more than just half of the succulent fruit. After breakfast, we packed our belongings, checked out of our weekend retreat and drove to the Fannin Battleground outside of Goliad. The battleground is the site of the Battle of Coleto Creek, the last stand for Fannin and his men before they were executed at the Presidio La Bahía under orders from Mexican Gen. Santa Anna. The battleground includes an exhibit with information about the battle, a granite monument honoring Fannin and his men and a picnic pavilion. Following our visit to the battlefield, we stopped at the Empresario Restaurant on the square in Goliad’s historic district. The food was delicious and featured homemade pies for dessert and bags of locally grown pecans for sale. After that last filling meal, we began our trip back home along twisting country roads, back to the reality of final exams and deadlines. We will not soon forget Victoria and Goliad, towns whose homegrown food and long history make for a great escape, especially during the holidays.